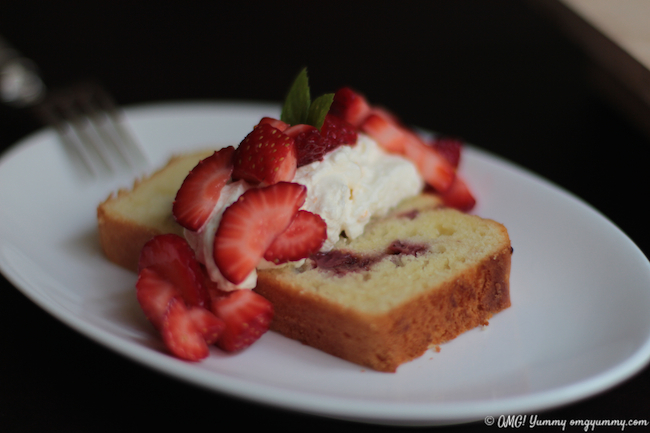 I developed this Roasted Strawberry Shortcake Recipe in 2014 for a recipe contest sponsored by The Daily Meal and Driscoll’s. 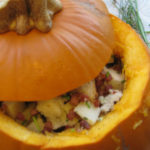 But I treasure this recipe because I developed it in partnership with my late son, Gregory Lee. He helped me fine tune it with his impeccable nuanced tasting skills and then stepped in to photograph. If this is the first time viewing the post, I hope you enjoy it and give the recipe a try. If this is a return trip, please make it again and think of my son when you do. This post was first published in 2014. California. The land of drought, Hollywood, high tech, and farming, among a myriad of other claims to fame and infamy. In fact, California is the leading agricultural producer in the country including providing about 80% of the strawberries consumed in the U.S.
As a resident, I buy fresh strawberries at the farmers’ market nearly every weekend year round. But there is nothing quite like the sweet candy-like flavor of a summer strawberry. Yes, You Can Roast Strawberries! If you follow my blog, you know I love to roast food, even if the temperature is roasting outside. And that includes fruit, in crisps or all on its own. 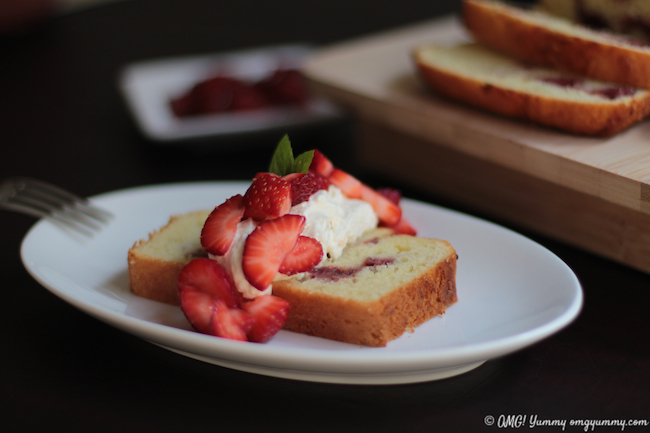 So my strawberry shortcake recipe features both fresh strawberries and roasted ones. 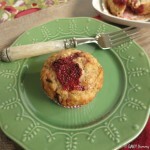 I experimented with the addition of rhubarb, but decided to feature just strawberries since rhubarb season is short. But what should the cake be? Biscuit-like? Cake-like? Something in between? My daughter really enjoys cakier strawberry desserts. So I decided to develop a quick bread style of shortcake. I started with a round cake but moved on to a loaf shape. Then I decided to use some intoxicating orange olive oil I brought back from Sorrento, Italy last summer, instead of butter. It is not at all unusual to make a cake with olive oil in Italy, Spain or Greece, but in this country, baking with olive oil is still a relatively new concept to many. I dabbled with it recently in a hamantaschen dough with excellent results. So why not use it in a quick bread? 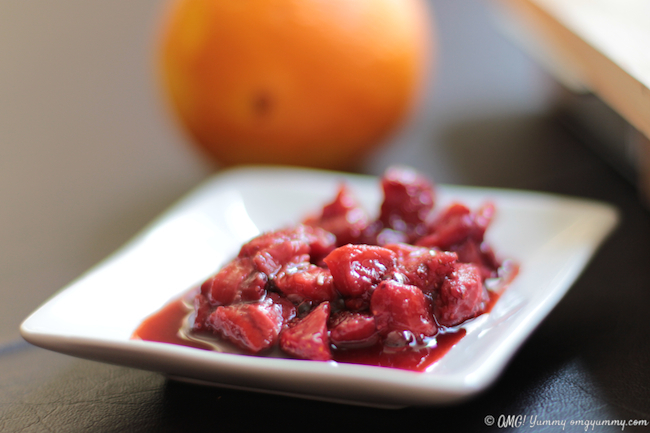 And I knew from my jam-making that orange and strawberries are a magical combination. First attempt with the olive oil was luscious – crispy on the outside, tender on the inside – but my food critic son suggested I tone back the orange to really highlight the strawberries. So in my next version of this strawberry shortcake recipe, I cut back on the zest and liqueur. I also wanted the roasted strawberries to mingle and meander more completely throughout the cake, so I upped the quantity and stirred them in like I was creating a marble cake. 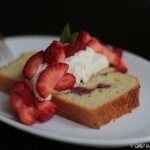 This seemed to produce the right balance of flavor and moisture for this strawberry shortcake recipe. It has a lovely almost lemon-yellow hue and the ruby-red strawberries provide a punch of juiciness, color, and flavor. When topped with fresh strawberries, more roasted strawberries, and the orange scented whipped cream, I think you’ll agree that this orange olive oil strawberry shortcake can stand on its own against any buttery biscuit version (not that I am opposed in any way to butter and its generous use in flaky, tender soul-satisfying baked goods). If you don’t have access to an orange-scented olive oil, infuse the sugar with orange zest (a tried-and-true Dorie Greenspan technique) to get that distinct orange flavor in the cake. Use a mellow olive oil (low-intensity) – even extra virgin – but don’t use your most expensive intensely flavored bottle. If baking with olive oil or roasting fruit is new to you, I hope you’ll give these techniques a try. 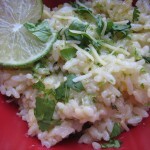 They are easy and adaptable to other uses in your kitchen. The roasted strawberries, for example, work as a topper to your morning yogurt or evening bowl of ice cream. They also marry with goat cheese for a terrific bruschetta topping with a sprinkling of basil leaves on top. What’s your favorite summer fruit dessert? 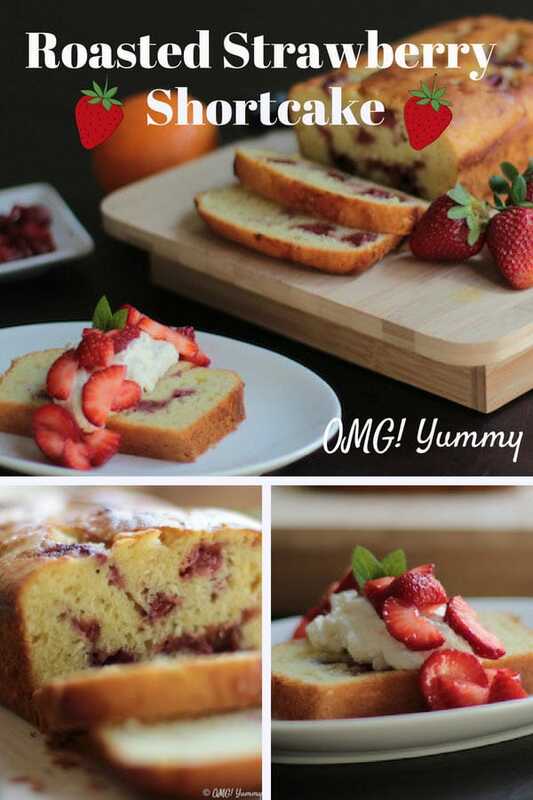 With a texture somewhere between a tender layer cake and a buttery biscuit, this olive oil-based quick bread serves as a hearty base for roasted and fresh strawberries and an orange-scented fresh whipped cream. Preheat oven to 375 degrees convect roast or 400 degrees regular bake. 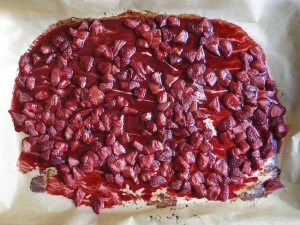 Place the cut strawberries on a parchment-lined baking sheet. 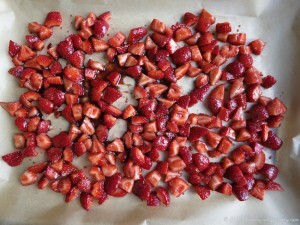 Combine the balsamic vinegar and sugar and then pour on strawberries and toss to coat evenly. Place cookie sheet in the oven. The strawberries should be done in about 12 - 14 minutes but check at 10 minutes. If they are bubbling and just starting to break down, they are ready. You want them to start caramelizing and softening up but not to fall apart. If not using convect, still check at 10 minutes but might take up to 15 minutes to finish. Go by sight, not just by time. Should yield about 1.5 cups of roasted strawberries with some syrupy juice. Can be made up to a day ahead of time. Refrigerate until use. If not using a non-stick loaf pan, grease and flour your 8-inch pan. I used a non-stick but still placed a piece of parchment lining the bottom only. Place dry ingredients in a small bowl, whisk together and set aside. In a medium-sized bowl, beat the sugar, olive oil, and eggs. You can use your mixer at this stage or just whisk by hand vigorously for a minute or two. IF NOT USING ORANGE FLAVORED OLIVE OIL, place the sugar in the bowl along with the orange zest and using your hands, incorporate the zest with the sugar then add in the eggs and olive oil and beat vigorously. Then add the buttermilk, vanilla, and liqueur and whisk until incorporated again. Now add the dry ingredients about 1/3 at a time just until incorporated. I used a whisk to start, then a mixing spatula to finish. Now spoon about ½ of the batter into your loaf pan. Measure out a generous ½ cup of your roasted strawberries and spoon about half of those on top of the batter. Then spoon most of the batter over that layer, Then the rest of the strawberries, then the final bit of batter over those. The second layer of strawberries does not need to be covered completely. Now take a butter knife and make an 8 pattern in the batter moving down the pan – probably will take about 3 strokes. 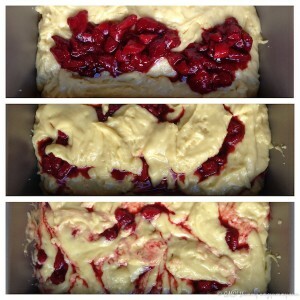 That’s all it takes to “marble-ize” the added strawberries into the batter. You can repeat this process one more time but don’t overdue do it or it will not have the marble look. Bake at 350 for 40 – 45 min. The cake will brown up nicely. Use a toothpick or longer wooden skewer to test doneness or just touch the middle. When it is nearly firm to the touch, it is done. 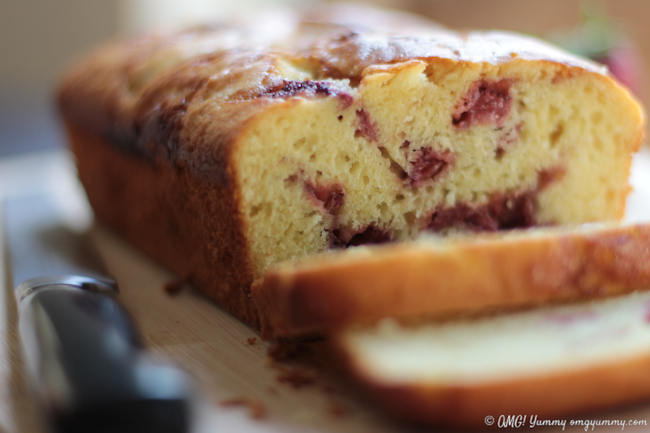 Let the cake cool in the pan, then remove to a cutting board or serving platter. While the cake is cooking, make whipped cream which can also be prepared a few hours in advance. Using a stand mixer, add all the ingredients and whip with the whisk attachment until it looks like whipped cream. I usually start on low and gradually increase the speed. It will likely take a minute or two to turn into whipped cream. Don’t walk away for too long or you may end up with whipped butter. To serve the cake, place a slice on a plate, spoon on some roasted strawberries, then a dollop of whipped cream, then fresh strawberries, a sprig of mint and enjoy. Preaching to the choir here, about olive oil in baking lol :):) Can’t stress how much we loved this! We really want to combine the balsamic (we have a great Modena balsamic in the pantry) with the strawberries and see how this works in a cake! You will love that balsamic with strawberries! Another way a friend taught me to use it is with a really fresh ricotta cheese, topped with the strawberries and balsamic. Delish! 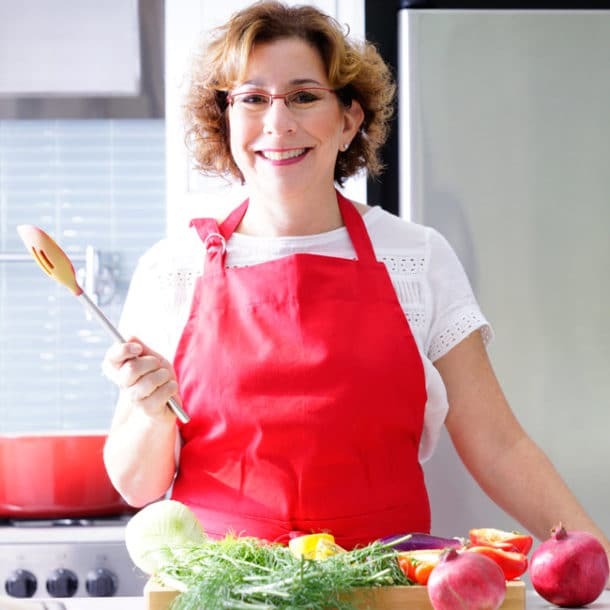 This recipe is so special to me because G helped me every step of the way and I really proved to myself that I had/have the skills to develop my own recipes! This looks fantastic. I’m definitely adding it to my must-make list!! My friend Barbie who owns a cooking school just taught a class on polenta and added some of that to the cake – it came out great. You are certainly inspiring me, Beth! I’ve never roasted strawberries, or don’t remember if I have. And as you know, I’m not shy of baking in summer so will make this cake. And I’m sure you would have ideas to make it even better! What a talented baker you are!! Yay! That’s what I aim to do! And you made such a beautiful version of it. It’s fun to just read the words you use to describe how you created this recipe. If only I had the patience to make it. I think the photos are wonderful too. I know that Gregory had refined taste buds and such a creative eye. Thanks for sharing these memories. Keep “fooding”, Beth! This sounds fantastic, Beth. Strawberries and balsamic are such a dreamy combo! 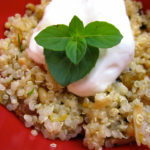 Thx Jenni – and the combo works in savory too! So versatile. What a beautiful cake. I never thought to roast the strawberries first, but it makes sense that it would add a new depth of flavor :-). They are like candy except way healthier!!! What a gorgeous cake Beth. Love everything you did here, including learning how you experimented to get your beautiful end result. Thank goodness for in-house food critics! Thanks Allie – sorry for the delayed response. Yes – in house food critics – can’t live with them, can’t live without them! Hope you try the cake – it’s kind of a happy dance in your mouth. Maybe I’ll make it for my dad’s birthday, now that I’m thinking about it … Have a great Friday. I’m making this for the long weekend! So lovely. Good luck on the contest! Thanks – let me know how it comes out! My neighbor made it and Michelle at The Daily Waffle. So far so good! Leftovers are great toasted with roasted strawberries on top! We just made the cake for breakfast — nothing wrong with dessert for breakfast, right?! It’s really tasty. Word to the wise, follow directions and do two layers of berries for best distribution in the cake and get them all the way to the edge. I wasn’t so careful and the first two slices didn’t have berries – whoops! Your cake sounds — and looks — wonderful! Good luck in the contest! I am on the cakier strawberry shortcake side as well. This looks delicious. Would be super easy to slice and serve at a summer BBQ! Yes – perfect for a summer bbq – all can be made in advance and you could even put it out as sort of a make your own shortcake with the roasted strawberries, fresh strawberries, and whipped cream. Thanks for stopping by! Looks and I bet tastes delicious. Love strawberry shortcake in any form. In season always have strawberries in house. But mostly to eat as dessert or on cereal. Hope you win the contest. Thx – maybe I’ll make this for our next gathering! I’m just ecstatic with joy over the sweet taste of early summer strawberries! Your scrumptious version of the classic American Strawberry Shortcake captures the lush flavor that evokes California summer! Thanks Deb! I bet you have some pretty great twists on the classic yourself! I have to make this recipe. It sounds so great, Beth. Good luck in the contest! Thanks Sarene – let me know if you make it and how it turns out.